Fall is here, and with it our love for soups. 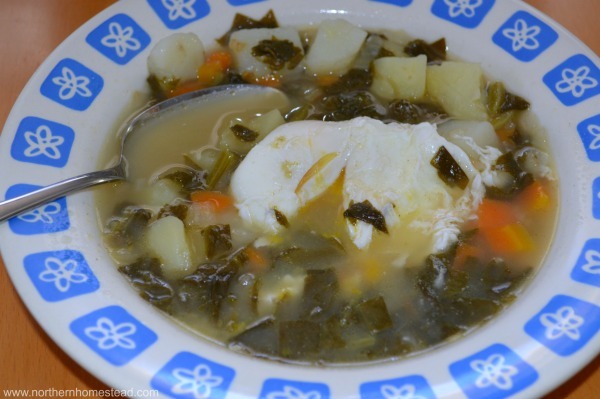 The sorrel soup with poached eggs recipe makes a light and delicious dish. 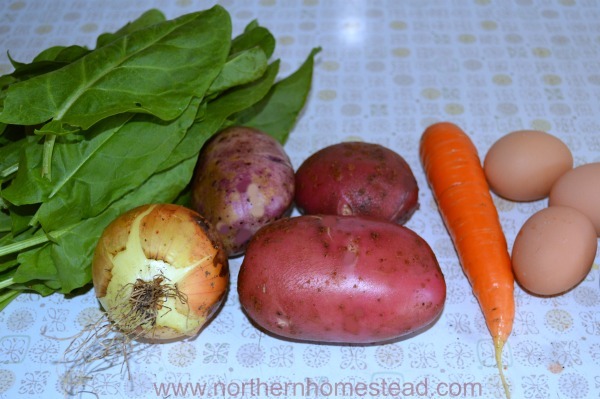 Growing up we called it summer borscht. The reason is that sorrel grows in the summer, hence it was made in summer. Our summers here in Canada are so short that I like to save all soup recipes for the cold months, including sorrel soup with poached eggs. 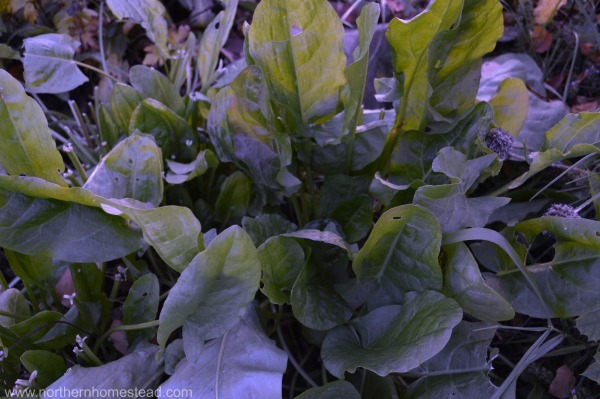 Sorrel is one of the first perennial plants to come up in spring, and if harvested continually, especially in cold climate, will grow all summer till late into fall. The leaves remind me a bit of spinach, but sorrel leaves have more taste to them; they are sour. There are many varieties of sorrel, the most common is French sorrel. You will have to plant sorrel once, and it will come back every year even in our Zone 3 garden. Sorrel makes a great addition to a salad. But the best way to use sorrel is in sorrel soup. 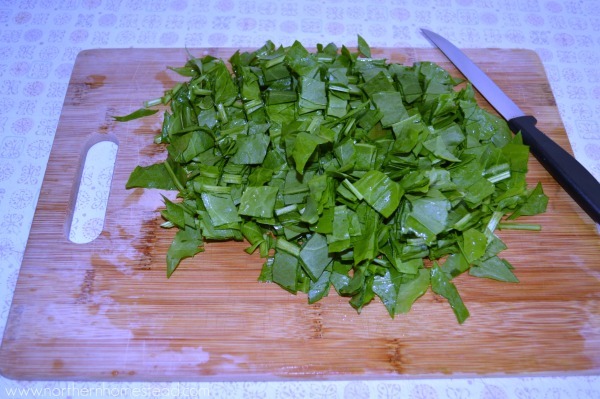 To be able to make the yummy soup in winter, I simply freeze the sorrel leaves cut and ready to be added to a soup. I do not blanch them. We love to grow what we eat and eat what we grow, this recipe is a great way to do just that – it can be made with all homegrown ingredients. Veggies fried in real butter and topped with homemade chicken broth make the soup delicious. We do not add meat to our sorrel soup, but you sure can if so desired. To make poached eggs is really simple. Here we made a video to show you how, if you haven’t done it before. Poached eggs can be enjoyed in many dishes, but the sorrel soup seems to be the perfect fit. 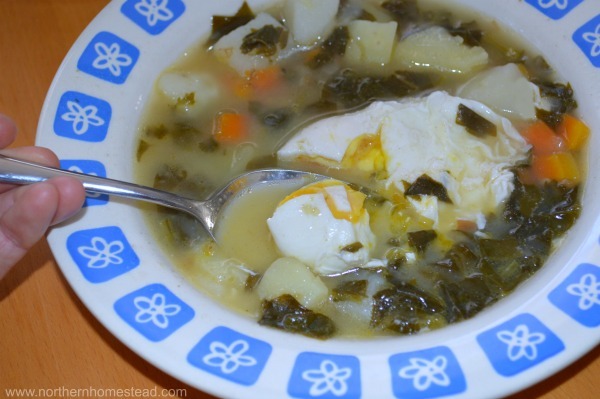 The natural acidity in the soup is perfect for poached eggs. Yum! If you have trouble to see the video below, go here.